Successfully Added Cell Phone Signal Booster with Auto Level Control (Dual Band GSM 900MHz/1800MHz) to your Shopping Cart. Low or no mobile signal inside your room, forcing you to make calls while leaning out a window? Stuck in a 2 year contract but bad reception prevents you from using your phone at home or work? Miss loads of calls because you have to leave your phone in one place to get a signal? Well no longer with this powerful Cell Phone Signal Booster. How does it work? 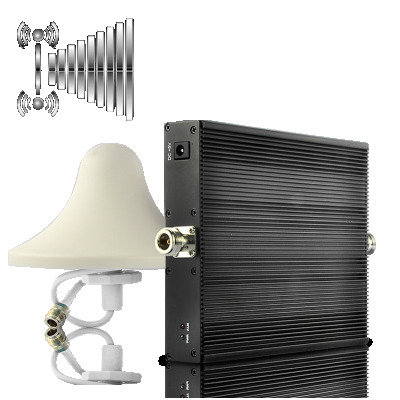 Long story short, this Cell Phone Signal Booster introduces a revolutionary, patent-pending technology that captures low-signals from outside, brings it inside, enhances/boosts it, then extends that signal back out to create a large, high-signal cell phone zone. To prove it works perfectly, our product tester locked himself inside a metal shipping container coated on the inside with aluminum foil. His cell phone was left with 0 bars, but what happened when we turned on the Cell Phone Signal Booster? You got it - full bars and a perfect signal. Who is it useful for? This Cell Phone Signal Booster is usually used in an area of the country where cell phone signals are normally weak, or locations where signals may be hard to reach, like basements, car parks, and tunnels. Due to its coverage area of up to 1,000 square meters in an open field, this Cell Phone Signal Booster has also found tremendous popularity in large areas owned by private businesses, such as supermarkets, cinemas, hotels, airports, etc. When you are in a normally low-signal zone, buying a new cell phone won't do anything. What you need is this Cell Phone Signal Booster (Dual Band 900MHz/1800MHz) for maximum bars and excellent reception. It even includes everything you need to get it up and running and is suitable for mobile networks worldwide (dual band 900/1800MHZ). Order now and we'll ship it out to you tomorrow. Brought to you by Chinavasion, the leader in consumer electronics. Instantly boost your cell phone signals! Comes ready to go - no need for anything extra! Does this Cell Phone Booster work in _____? This Cell Phone Booster works in the 900 and 1800MHz frequency bands, which is most countries worldwide. If you are still not sure, please visit http://en.wikipedia.org/wiki/GSM_frequency_bands and see what frequency band your country is on. Does this Cell Phone Booster work with 3G phones? No, this Cell Phone Booster was designed to only work with 2G/2.5G/2.75G GSM phones on the frequency bands of 900 and 1800MHz.